FEATURED TRAVELER: Aphrodite Cruz, "An Advocate of Responsible Tourism"
I met Aphrodite during my recent trip to Roxas City and Iloilo. From the moment I met her in the airport, I knew she's different. She's jolly, full of energy and easy to get along. On the 4 days that we're together on tours, I learned more about her. She's a lady with a purpose. A traveler and tour organizer who promotes responsible tourism. Let's get to know more about her and her advocacies as she graciously answers these questions I sent her. 1. Please tell us more about yourself. Who is Aphrodite Cruz? I am born, raised, and based in Manila. Currently, I live in Sikatuna Village, Quezon City. I graduated from the University of Santo Tomas in 2009 with a degree in AB Journalism. Shortly after college, I began my career in PR (Public Relations) under the mentorship of Mr. Gerry Zorrilla, a well-known and well-respected figure in the Philippine PR industry. I worked in his PR firm for about 6 years with a short break in between to try out Advertising. In the first quarter of 2014, I left the corporate world completely and decided to venture into PR and Marketing consultancy because I wanted to work on accounts that are so much closer to my advocacies in life (responsible tourism, countryside development, and environment preservation.) One of my clients right now is Pueblo de Panay, a 400-hectare Filipino-inspired mixed-use and multi-zoned township at the country’s seafood capital, Roxas City, Capiz Province. It is an emerging eco-driven commercial-business district and the site of the first IT/Techno Park in Northern Panay. At present, I am a PR and Marketing Consultant by profession. I am also the Co-founder and Marketing Manager of Las Islas Travel and Tours, a new travel agency and tour operator based in Roxas City, Capiz Province, Panay Island, Western Visayas. At the same time, I am a contributing writer for Experience Travel and Living Magazine and the Panay Island correspondent for ExperienceTravel.Ph, the magazine’s online counterpart. 2. Can you tell us what made you put up Las Islas Travel and Tours? I’m the kind who needs to be moving around all the time. I just can’t stay put in one place. The big mole on my left foot can attest to that. Hehe. :) I especially like going to rarely visited and often unexplored places in the country. Don’t get me wrong, Boracay Island is truly gorgeous and world-class. Cebu Island is even more stunning. But I guess what I’m trying to drive at is, these places are already over-exposed and promoted profusely. We live in a unique archipelagic country with more than 7,000 islands and islets. Let’s also pay attention to the other not-so-well-known destinations in the country that are as equally beautiful as those that we commonly know. It is this exact reason that prompted me and my partners to put up Las Islas Travel And Tours. Right now, Las Islas Travel And Tours specializes in tour packages around Panay Island in Western Visayas with primary focus on Capiz Province, home to enchanting waterfalls, unique cave systems, and long flowing rivers; and the Gigantes Group of Islands in Northern Iloilo, which boasts of virgin white sand beaches, beautiful limestone formations, and rich aquatic biodiversity. 3. What are your advocacies? I am a big believer of responsible tourism. As a tour operator, we have a huge responsibility for the destinations that we promote. It’s one thing to be able to provide job opportunities to the locals, and another to ensure that the destinations remain taken care of as if no tourist ever visited. Our role is very significant when it comes to maintaining the natural beauty of the place and keeping it clean and well-preserved. To travel responsibly means to be aware of your surroundings and to take into consideration the effects you’re leaving on a specific destination. Sometimes when we travel, we forget that we are only there to visit the place and enjoy it as much as we can. Most of the time, we forget that there is a way to fully partake in a destination’s beauty and grandeur without destroying the place or leaving a negative impact like vandalism, irresponsible disposal of trash, unnecessary collection of shells and corals, and many other things. We are only visitors. As the adage goes: take nothing but pictures, leave nothing but footprints, and kill nothing but time. In a nutshell, Las Islas Travel And Tours is more than just a business venture; Las Islas Travel And Tours aspires to create a community of responsible and environmentally conscious travellers by educating clients about proper garbage disposal, waste segregation, environment conservation and preservation, and the protection of our seas and unique biodiversity while at the same time helping clients enjoy a destination’s majestic attractions, both man-made and natural. I believe that if you truly want to help the Philippines, you should go to the countryside. One of the greatest and most selfless things you can do for your country is to share your time and expertise to the areas in need of help. It’s a way of giving back. Supporting countryside development also means helping reduce congestion in Metro Manila while promoting a more equitable distribution of wealth in the country. 4. Tell us more about your plans for Las Islas Travel and Tours? How do you see Las Islas 5 or 10 years from now? We plan to add more tour packages promoting our very own beautiful islands, especially those that aren’t being visited and explored as often as, say, Palawan, Boracay, and Cebu. We also plan to reinforce more ecological practices during our tours. Right now, we are exploring the possibility of strictly implementing the Zero Waste Challenge/Zero Waste Management Scheme. In 5 to 10 years or so, Las Islas Travel And Tours will be one of the major key players of responsible tourism not only in the Visayas, but also throughout the Philippines. 5. How would you encourage more people to be responsible tourists? Before every tour, we brief our clients about responsible tourism and make them sign our traveler’s manifesto. It’s basically a pledge to be a responsible traveler. We made it very simple so that our guests would easily understand the pledge. Guests who are caught throwing their trash on the beach or on the road during our tours are reprimanded and asked to pick up their trash and throw it/them in the garbage can. There is only one planet Earth. There is only one Philippines. If we don’t take care of our own home, then there wouldn’t be a home for future generations to come. Cleaning up the whole planet to help in its preservation is no joke. It’s not the role of just one person or organization. It’s the responsibility of every citizen in this planet. We try to do what we can. If you can’t clean up the whole planet, you can start by being a good and responsible neighbor or in our case, by being a responsible tour operator/travel agency. The first leg of the Las Islas Clean Beach Campaign was done in partnership with Ms. Maruja Reyes, owner and general manager of Maruja Flora’s Island Paradise Resort in Cabugao Gamay Island, the most popular among the Gigantes Group of Islands in Carles, Northern Iloilo, a rising tourism destination currently experiencing massive tourist influx because of the peak season. Improper garbage disposal and irresponsible tourists are just two of the major concerns not only in Cabugao Gamay Island, but also in the neighboring islands namely: Tangke Saltwater Lagoon, Antonia Beach, Bantigue Sandbar, Cabugao Dako Island, and Gigantes Norte. 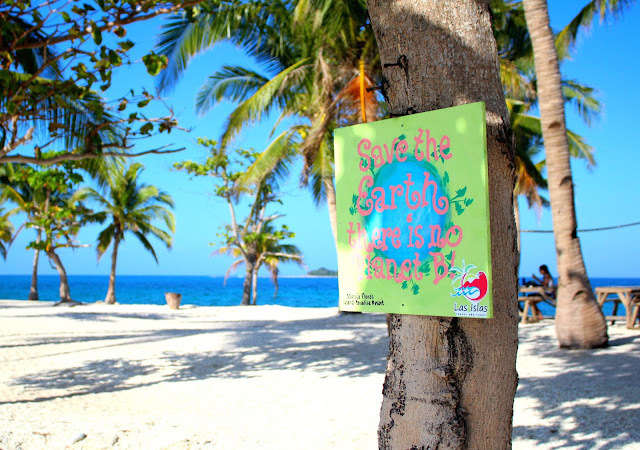 To preserve the pristine beauty of the islands, starting with Cabugao Gamay Island, Las Islas Travel And Tours initiated a beach clean-up and put up green/eco signs all over the island reminding the public to be responsible with their own garbage and not destroy an island known for its crystal clear waters, white sand, beautiful shells, and rich marine life. The next steps for Cabugao Gamay Island is to make it self-sustaining (in terms of water supply, composting, etc. ), and actively implement proper waste segregation techniques. 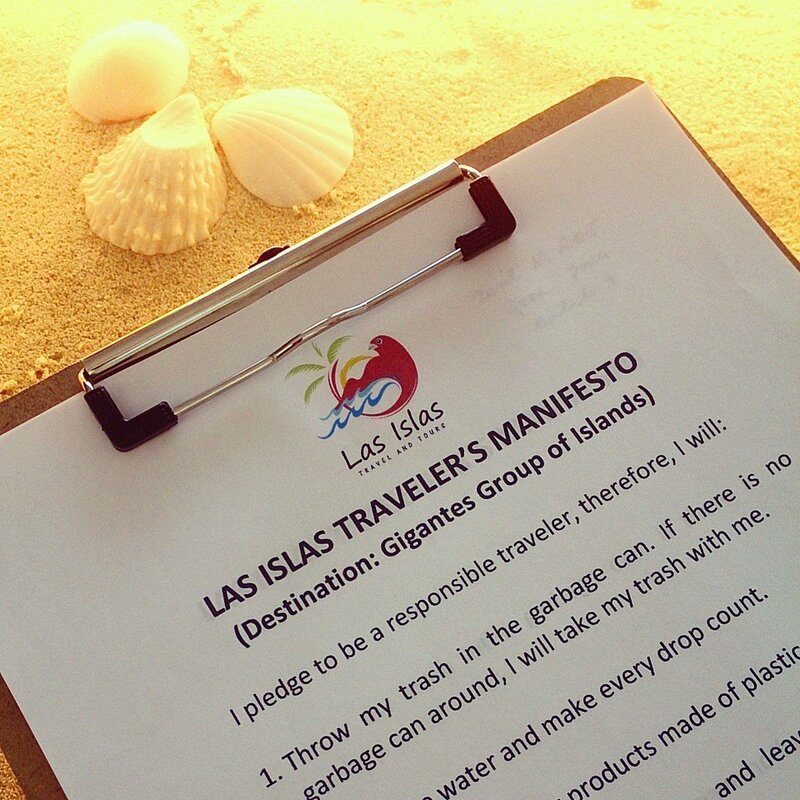 We are evaluating a few islands as the second leg of the Las Islas Clean Beach Campaign. Just like Aphrodite, we can also do our part in taking care of our environment by being a responsible traveler. We can all make a difference! Let's do our part!